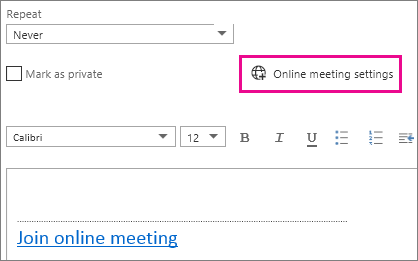 You can use Outlook or Outlook Web App to schedule a Skype meeting--the same way you schedule meetings normally but with one or two extra clicks. If you don’t use an Outlook program (or Windows), you can set up new meetings using Skype for Business Web Scheduler. Access it at https://sched.lync.com, or learn more at Lync Web Scheduler. Be using a browser that supports the full version of Outlook Web App. Have a user name and a password from an organization that has a business or enterprise subscription to Office 365. 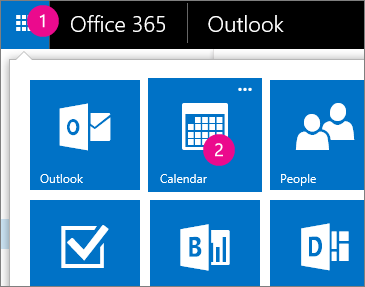 In the Office 365 portal, click the app launcher, then click Calendar to open the Calendar app. Click the plus sign or New just below the app launcher, and fill in the meeting information as usual. In the middle of the meeting window, above the message area, click Online meeting. Call-in details, like a Join online meeting link appear in the message area. If your account is configured for dial-in conferencing, you’ll also see a Find a local number link. You’re not using a browser that supports the full version of Outlook Web App. Your Office 365 subscription does not include Skype for Business. You’re logged in as a user who hasn’t been granted a license for Skype for Business. If you’ll have in-person attendees, in Location, type a location for the meeting, such as a conference room, or click Add Room for help finding a conference room. Tips To view settings for who has access to the online meeting, who has to wait for you to admit them into the meeting, and who can present during the meeting, click Online meeting settings (just above the message area). (Optional) In the meeting area, you can type an agenda or other information about the meeting. Be careful not to change any of the online meeting information. (Optional) To add a picture or attachment with the agenda, at the top of the meeting window, click the More actions icon (…), click Insert, and then click Attachments or OneDrive files or Pictures inline. At the top of the meeting window, click Send.